If you have money in stocks, like through your 401(k), you might feel like you’re on a roller coaster, given the volatility of the market recently. We’ll try to shoo the ghouls and goblins away so you can gain confidence in making investment decisions. Why do stocks crash so often in October? It’s just that some of the biggest, and therefore, most memorable stock market crashes in history have occurred in October. The great crash of 1929 included three infamous days in investing history: Black Thursday (October 24), followed by Black Monday (October 28) and Black Tuesday (October 29). The combination accelerated the Great Depression. Then there’s Black Monday in 1987 (October 19), the single biggest percentage decline in one day, in the history of Dow Jones Industrial Average. However, using the monthly returns calculator on the moneychimp website – which pulls in about seventy years of S&P 500 data, we see that October yields positive returns. September is the month to watch, with an overall negative return. In addition, October has brought the end of more bear markets than the beginning. So other than Halloween, there’s little need to be scared in October. Is market timing a good investment strategy? No – not for normal people, the non-financial types. Let’s make sure we’re on the same page by defining “market timing”. Wikipedia offers a simple definition of “market timing”. The problem with market timing is the risk you take of missing out on the really good days. A few days each year have a BIGG impact on your overall return. We found a great series over at the Index Fund Advisors site. They call it the 12 Step Recovery Plan for Active Investors. Market timers are active investors. We’ll share a passive strategy below. In Step 4, they show how costly a market timing investment strategy can be. Assume you invested $10,000 in the S&P 500 index for 20 years, starting on the first day of trading in 1998 and ending on the last day of trading in 2017. If you had just let it ride, it would have grown by $30,135 to $40,135. However, if you missed the 5 best days, your investment would have only grown by $16,625 to $26,625. In other words, your return would be 45% less. University of Michigan Professor H. Nejat Seyhun conducted a study for Towneley Capital Management. He looked at data on a diversified portfolio of U.S. stocks, from 1926 through 2004. He found that, $1 invested at the beginning of 1926 would make $1,919.18 if left untouched until the end of 2004. But if you missed the 12 best months, $1 only earned $196.88. So 90% of all gains came in 12 of the 948 months. A JP Morgan Asset Management study looked at the performance of the S&P 500 during the period from 1995 through 2014. They found that 6 of the best 10 days occurred within 2 weeks of the 10 worst days! We could go on – in fact, we had planned to – but we bet you get the point: Market timing is not a good investment strategy for normal people! 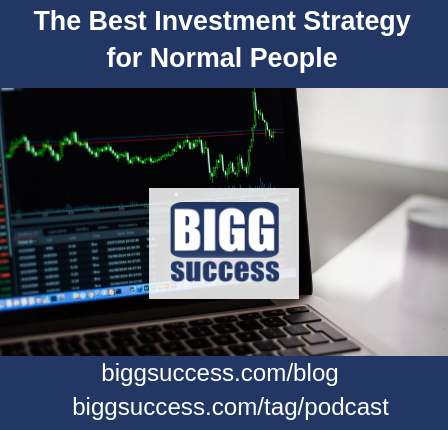 What is the best investment strategy for normal people? According to Warren Buffett, the best investment strategy for normal people is to keep investing, particularly when the headlines look bleak. It’s impossible to predict what stocks will do today, tomorrow, this week, next week, this month, next month, this year or next year. But stocks have historically gone up over the long haul. Of course, the past is not an indicator of the future. We strongly recommend that you work with a financial professional who can apply these concepts to your specific situation. But in general, a long-term, buy-and-hold strategy is still the best investment strategy for normal people. It leads to BIGG success! The best way to “buy low and sell high” is to buy at the market and be patient. 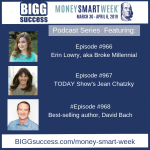 Then subscribe to our FREE newsletter where you’ll get bonus tips and tidbits not discussed on today’s show or in the blog.